A rainy day did not dampen the spirits of a dozen or so Green-Rainbow Party members attending the Boston May Day events, including: Danny Factor, Isabel Espinal, Joanna Herlihy, Nadia Franciscono, Shirley Kressel, and Wes Nickerson. Some of them gathered at 8 am outside of Bank of America, leafleted passers by and marched through the financial district of Boston carrying the GRP banner. About 200 people rallied at noon at Boston City Hall for a May Day program with several speakers, including Isabel Espinal. A statement by Chuck Turner was read also, followed by a chant of "Free Chuck Turner!" At all three rallies during the day, GRP members stood and displayed the banner on or beside the stage for everyone to see. 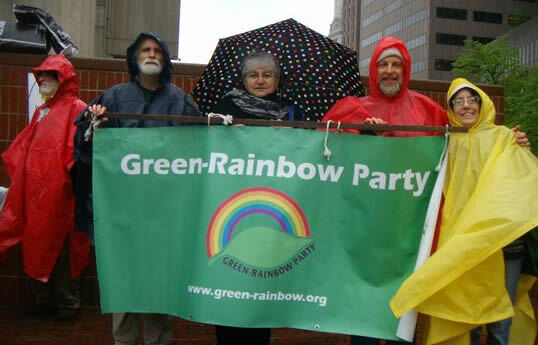 The Green-Rainbow Party joined with Occupy, labor, immigrant, and social justice organizations. The GRP was the only political party to participate. In the afternoon Danny Factor and Wes Nickerson marched with several hundred people in the Immigrant March, which began with a rally in East Boston and marched through Chelsea to an even bigger rally in Everett. In the following video there are three different marches. The Immigrant March is the second one. The Green-Rainbow banner becomes visible starting at about 3:45 minutes into the video. All in all, it was a great way to celebrate International Workers Day. More pictures are posted on our Facebook page. Boston May Day 2012, new GRP blog post.